Earlier this year at the IFA 2016 in Berlin, Samsung introduced two new smartwatches, the Gear S3 Classic and Gear S3 Frontier. The wearables went up for pre-orders at Best Buy, but the official release date was unknown until today. 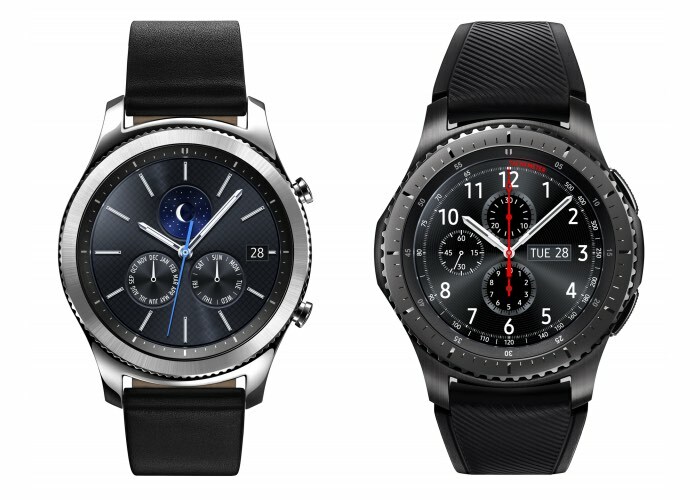 The Korean company has announced that the Gear S3 Classic and Gear S3 Frontier will hit the retail shelves in the US on November 18th, starting from $349.99. Along with Best Buy, the new smartwatches will be available from Samsung’s own online store as well as Macy’s and Amazon. As for carriers, the LTE-enabled version of the smartwatches will be available from AT&T, T-Mobile, and Verizon. The launch dates and pricing details will be revealed by the respective carrier at a later date. The smartwatches ships with 1.3-inch 360×360 circular Super AMOLED touchscreen, a 1 GHz dual-core processor, 768MB of RAM, 4GB of storage, Bluetooth, Wi-Fi, as well as a microphone and a bunch of other sensors to measure health-related metrics. Last but not the least, the smartwatches ship with Tizen as their operating system. Anyone interested in picking up the new Gear S3 Classic or Gear S3 Frontier?